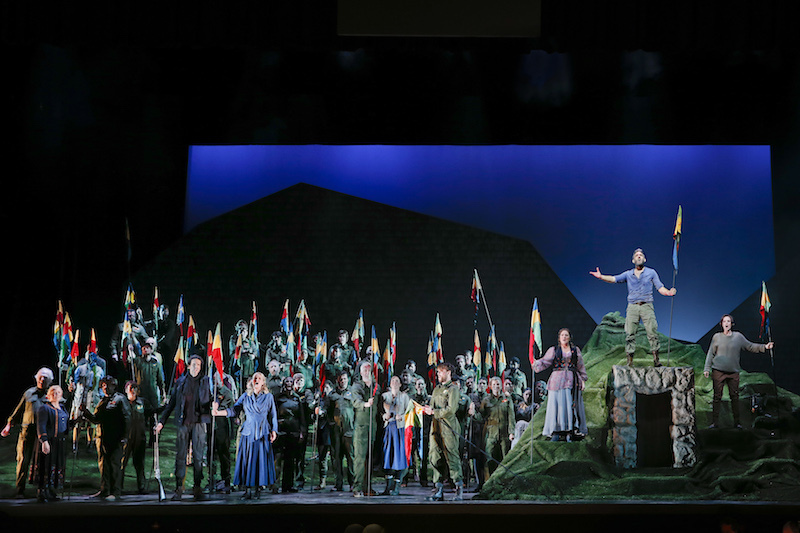 Bastille Day was an ideal day to open a season of William Tell, Rossini’s well known but rarely performed opera about the Swiss freedom-fighter. With a final plea that “liberty descend once again from the heavens” this extravagantly told tale about Swiss liberation from the yoke of Teutonic oppression resonates with French revolutionary ideals, with liberty, expressions of fraternity and equality throughout. With an absolute cracker of an overture, you might expect this opera to be performed at least every once and a while. In fact, this is the first fully staged production of the work in Australia since 1876! There are two underlying problems preventing performances. The first is the sheer length of the original. To crack the Paris market (which he did with this, his final opera), Rossini had to provide substantial ballet music which pushed an average show out to the five-hour mark. Secondly, the opera requires a relatively large number of quality principals, especially the tenors, who have to produce an extraordinary number of high Cs. Top marks, then, to Richard Mills, VO’s intrepid artistic director for handling both of these problems effectively. Together with director, Rodula Gaitanou, he has shorn the work of its ballet music to “achieve clear storytelling, strong drama and unfussy, lucid staging”. To a large extent, they have succeeded in their aim. The resulting length of this production is a bit over three hours, but time passes quickly as the dramatic pacing rarely flags. Even more impressive is the casting which is strong from top to bottom. 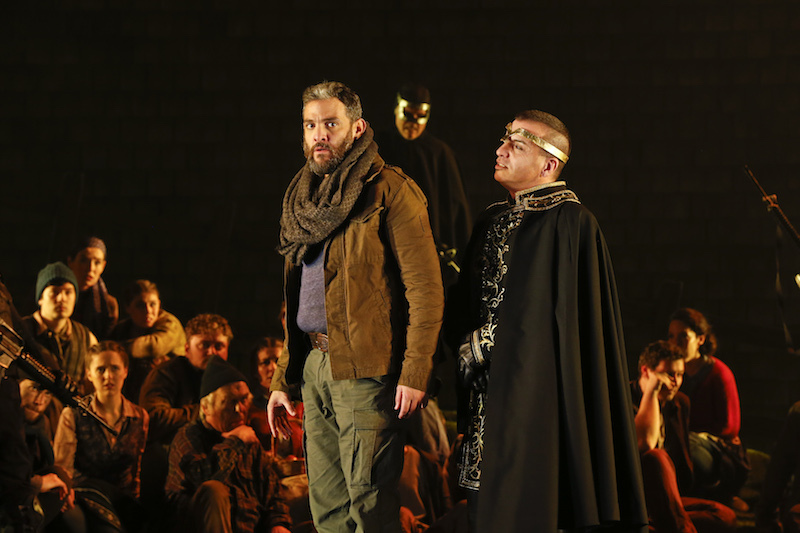 Argentinian baritone, Armando Noguera does a fine job as William Tell, bringing both revolutionary zeal and paternal tenderness to the role. In particular, his handling of the emotional build-up to the all-important apple and arrow moment in Act III showed stamina and dramatic versatility. Victorian Opera regular, Carlos E. Bárcenas excels as the love-struck Arnold, making seemingly light work of all the successive high Cs in the final act. In his portrayal of community elder and martyr Melchtal, Teddy Tahu Rhodes displays an impressive vocal and dramatic gravitas. His fellow patriot, Walter Furst is ardently sung by young Melbourne bass, Jeremy Kleeman. 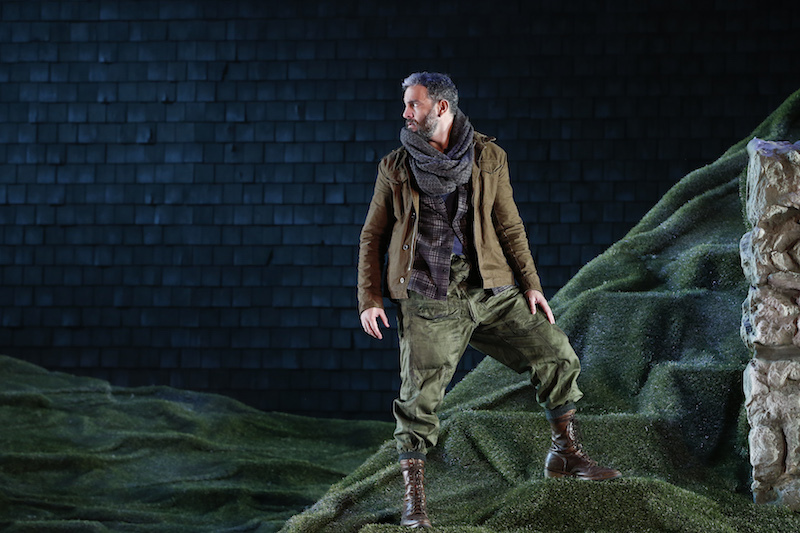 Paolo Pecchioli made such an impression as the villain Gesler that he elicited some light-hearted booing as he received his applause on opening night. Paul Biencourt was his suitably dastardly accomplice, Rodolphe. Local singers, Timothy Reynolds and Jerzy Kozlowski acquitted themselves with distinction respectively in the small roles of the drunken Ruodi and the herdsman Leuthold. Gender balance was not much of an issue with 19th-century revolutionaries or composers, but even though few in number the female roles make a telling contribution to the whole. Alexandra Flood as Tell’s son, Jemmy brings plenty of energy, colour and clarity to this “pants” role (while also wearing an apple well). Liane Keegan shows plenty of maternal concern as Tell’s wife, Hedwige. By Act III when Arnold and his lover, Mathilde, the Austrian princess bid each other a fond farewell, Danish-based soprano, Gisela Stille had developed even greater vocal warmth and agility than she displayed in Act II, making for some memorable reflective moments amidst the prevailing busyness of the story. Another key protagonist in William Tell is the chorus, as it most importantly represents the community seeking freedom. Stocked up with plenty of tenors and basses, the male chorus delivered a thrilling and hearty conclusion to Act II, as the patriots vow to avenge the death of Melchtal and throw off the yoke of Austrian oppression. 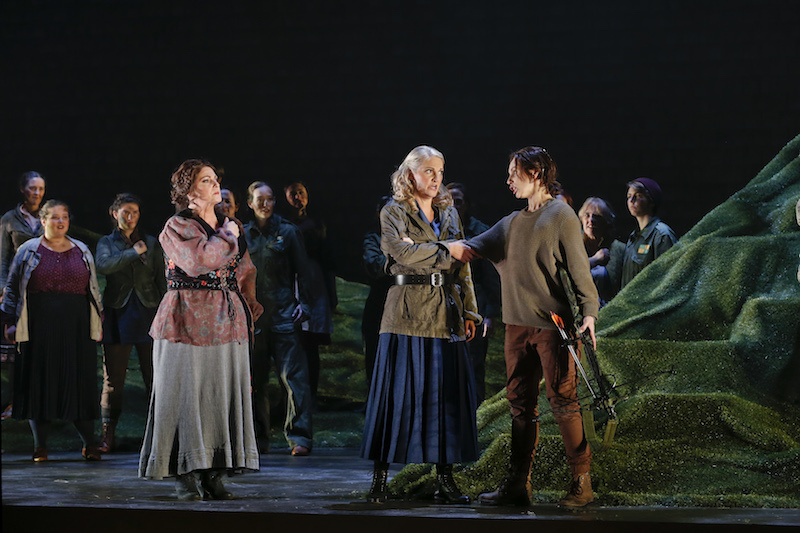 The women’s chorus provided a welcome change of colour at the beginning of Act IV, and the final ensemble extolling hope in the new nation provided a moving conclusion to this epic work. Orchestra Victoria under the baton of Richard Mills played superbly all evening, never flagging throughout this musical marathon. Rossini’s inventive orchestration is a delight to listen to and rarely occludes the voices. Special mention must go to the principal cellist, Melissa Chominsky, whose uber-Romantic solos in the overture and Act III were an unalloyed pleasure. In accordance with the wishes of Mills and Gaitanou for a straightforward production, Simon Corder has produced a simple set evoking the Swiss countryside with a large, sloping hillside predominating, and a smaller, closer pyramidal structure serving various uses framed by a back wall representing the mountains. These elements cleverly aid acoustics by providing both elevation and projection for the singers. The set has a rather dowdy, homemade look about it that fits with Gaitanou’s setting of the story as a dystopian parable for our times, set sometime in the future, where a community living in harmony with nature is set upon by technologically advanced tyrants. Such a focus works better in the first half, because as the opera progresses it is overtaken with themes of revenge, nationhood, romance and liberty. Esther Marie Hayes’ costume designs were at the service of the story and unambiguously symbolic: natural tones for the Swiss, and black and gold for the baddies. However, dressing the Austrian soldiers in Act I in what looked like cast-offs from a Star Wars movie and having them spray noxious chemicals from backpacks struck me as a tad unsubtle. These are minor cavils in the face of an outstanding achievement in bringing this massive work to life for 2018 audiences. In terms of quality musical storytelling, VO has hit a bullseye. Whether its name is Silver or not, mount your trusty steed and set off to the Palais to experience this opera while you can.